The curtain appears to have dropped on one of the finest careers in National Hockey League history. 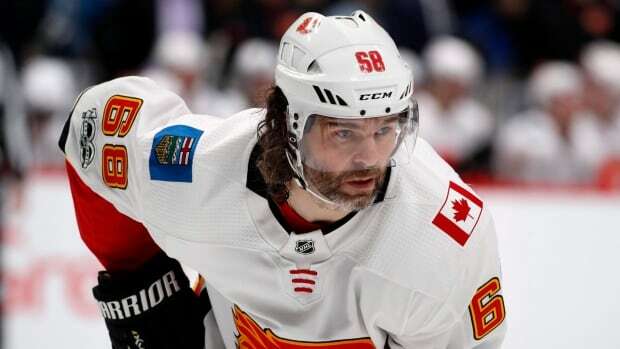 On Monday, the Calgary Flames cut ties with Jaromir Jagr, assigning the veteran forward to HC Kladno of the Czech 1 Liga in the Czech Republic. “There were certainly some glimpses of what he could do, but we weren’t able to sustain it enough,” said Flames general manager Brad Treliving. “There was a lot of stops and starts [in his performance] and he really couldn’t build a base. Jagr, who turns 46 on Feb. 15, cleared waivers Monday, a day after being waived by the Flames. “Although I am very disappointed that things did not turn out as we had hoped due to a number of circumstances,” Jagr, a Kladno native, said in a statement. “I am deeply grateful to the Flames, the fans and the city of Calgary for having welcomed me so generously. If Jagr is indeed done with the NHL, he leaves an impressive body of work — 1,733 games, 766 goals, 1,155 assists, 1,921 points. Only Gordie Howe (1,767) and Mark Messier (1,756) have appeared in more games. Only Wayne Gretzky (894) and Howe (801) have scored more times. And only Gretzky (2,857) amassed more points than No. 68, who spent three full seasons (2008-11) with Omsk Avangard of the KHL. With the Flames, however, production had been relatively minimal for the six-foot-three 230-pound Jagr (one goal, six assists in 22 games). Yet Jagr’s impact was felt in the dressing room. “He’s a legend in the game and a guy I’ve looked up to my whole life,” said Flames centre Sean Monahan. “Getting to meet him and know him as a person, and [see] the way he prepares and treats the game of hockey was pretty special. Looking for offensive punch on the right side, the Flames signed Jagr on Oct. 4 — opening day of the regular season — to a one-year, $ 1-million US deal. Calgary marked Jagr’s first Canadian stop and ninth NHL team overall. “It was a short time and, in a lot of ways, it was a perfect storm that worked against him not being able to have a training camp, then dealing with some injuries,” Treliving said. “But having said all that, we don’t regret the experience, we don’t regret the decision to bring him here. Return still in the cards? Jagr’s final point was an even-strength assist on Mark Jankowski’s game-opening goal in a 3-0 triumph Nov. 30 against the Arizona Coyotes. “We all know he was struggling with [an injury] here,” said Flames winger Michael Frolik, who’s also from Kladno. “He was always healthy in his career, so it was something new for him. At the 1990 NHL draft, Jagr was selected fifth overall — behind Owen Nolan, Petr Nedved, Keith Primeau, Mike Ricci — by the Pittsburgh Penguins, with whom he won two Stanley Cups (1991, 1992). Five times — including four straight years (1997-2001) — he earned the Art Ross Trophy as the league’s top scorer. In 1998-99, he captured the Hart Trophy as the NHL’s most valuable player. But conditioning, as much producing, came to be his calling card. On Sunday night, the night before his departure from the NHL, Jagr could be found working out at Flames headquarters.